This week the Fancy Food Show was in San Francisco, bringing purveyors of canned olives together with people introducing fruit-flavored foam. It's a great opportunity for the food media to stumble around aisles full of chocolates and flavored popcorn, trying to get excited about gluten-free ramen. Like many food media, I left Fancy Food Show almost unable to taste any more, but stopped by a secondary show called Food Fete because, with 20 vendors instead of 2000, it's easier for the brain to process. There's a booth called "Pujols Kitchen," selling cookware, with thankfully no samples to taste, although that's also a problem for me because while I often write about food, I have never yet written about cookware. And there's a bald-headed guy behind the booth wearing a white shirt. He's a little taller than me, seems strongly built, and looks familiar. Did he throw me out of a bar or something? Wait a minute -- I had to ask him -- "Are you Albert Pujols?" Sure enough, he's there to support his wife Deidre's nascent cookware company. And he's in a room full of media. And so far as I can tell, nobody but me knows who he is. I hate to be genderist, but at the time I was the only male writer there. So that's part of it. Pujols is easily baseball's greatest hitter since Barry Bonds slowed down in 2005, but he spent his whole career in St. Louis until last season, when he went to the Angels. Neither of them play the Giants much. So that's part of it. But still. Cat Cora or David Chang wouldn't have been able to walk through this room without being surrounded by people seeking quotes, but baseball's highest paid player is just standing against the wall, with nobody noticing. 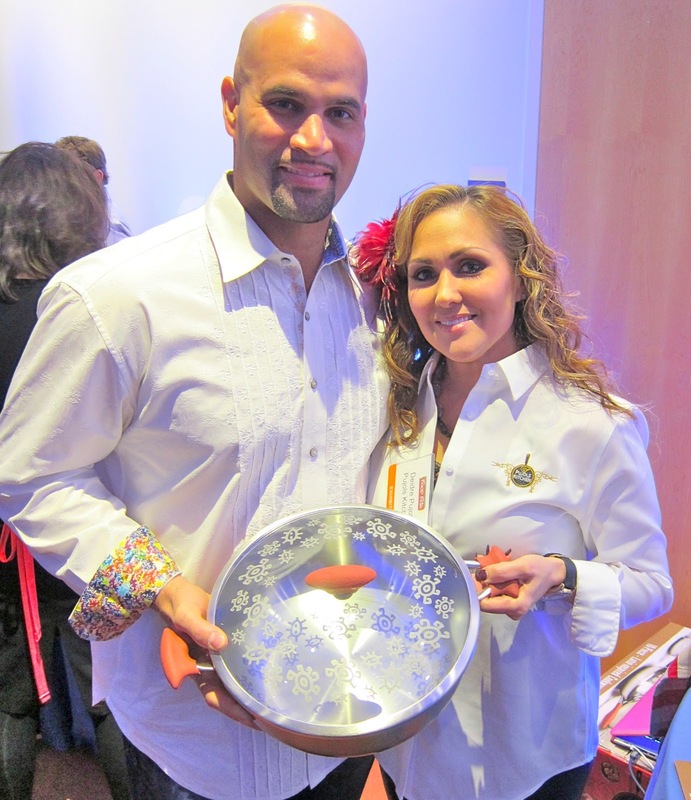 So I interview Deidre Pujols about her cookware and her cooking. It's a nice story. She's from Kansas City and when she started dating Pujols, who's from the Dominican Republic, "I met his grandma, who is my hero. She was cooking over large aluminum pots. When I decided he was the guy I wanted to be with, I would make appointments with her to learn to cook." Pujols and his family moved to the US when he was 16, but he never stopped loving the Dominican food he grew up on. It's a cuisine based on poverty: big pots of rice and beans, stretching meat as far as they can. "The people in those impoverished communities in the Dominican, they don't have a lot of resources, but they can make the best food," Deidre Pujols said. "They can cook it on an empty coffee can. They'll make rice with pigeon peas and feed the whole neighborhood. I'm just in awe that they're so simple and they make it so great." Deidre Pujols has mastered cooking Dominican food well enough that when Dominican players on opposing teams come to Anaheim, she cooks big pots of dishes like chicken with beans and rice and Albert takes some to the ballpark for the opposition. "I always make sure they tell him if they like it or they don't," she says. Albert Pujols says her reviews are positive, because she knows the secret. "Believe me, don't cook a meal for a Dominican man without beans and rice," she says. The couple has 5 kids, so starting the cookware company took some time. She designed the pots and pans in 3-ply stainless steel based on the Dominican aluminum versions. Albert Pujols signed a $254 million contract in 2011, so "he gave me the loan," she says. The cookware isn't expensive for premium stuff; the main line of pans runs $45 to $68. I'm not a cookware critic, so make your own decision. Albert and Deidre were patient with me as I tried to take photos of them and the cookware, but both were wearing white shirts in low, blue-tinted lighting, so what you see is the best I got. I shook Albert Pujols' hand; will it surprise anyone to learn he has a strong grip? On my way out, I chatted with a couple food writers and publicists I know. I told each of them, "I just interviewed Albert Pujols." All said the same thing: "Who's that?" The first time I said, "You really don't know?" The second time, similar. The third time I had the right answer: "His wife sells cookware." Good for you, thanks fun read.